SEOUL -- South Korea's sole aircraft maker, Korea Aerospace Industries (KAI), won a defense contract in Indonesia to ship three turboprop basic trainers and install radar and machine guns in KAI's supersonic trainers which are in service in the Southeast Asian country. KAI said Thursday that the deal worth about 100 billion won ($89.5 million) was signed on the sidelines of the Indo Defence trade fair for military technology in Jakarta. Indonesia has imported KAI's KT-1 basic training aircraft and T-50 supersonic trainers. 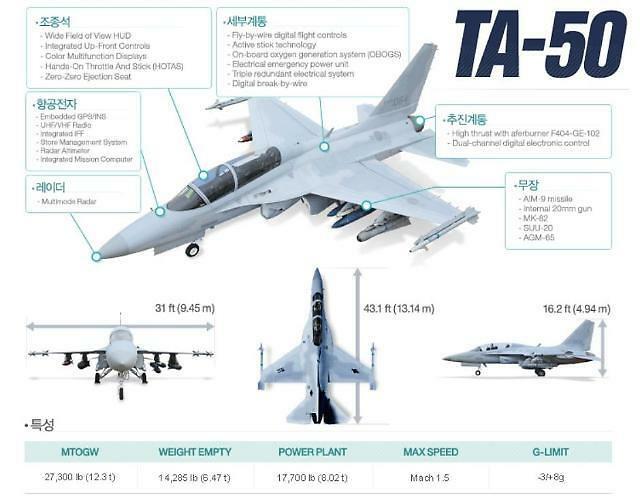 With technology from U.S. partner Lockheed Martin, KAI produced South Korea's first supersonic trainer, T-50, which has been developed into aerobatic and combat variants such as FA-50. A variant of T-50 has been ordered by Indonesia and the Philippines. In a campaign to shore up its charge into the global warplane market, KAI has tried hard to win a lucrative Pentagon contract worth $9.2 billion to replace a fleet of aging trainer jets. In September, KAI and Lockheed lost to a consortium of Boeing and Saab. Now, KAI hopes to export FA-50s and Surion, a twin-engine transport utility helicopter, to Indonesia, which has maintained close military cooperation with South Korea. In a military project to develop 120 home-made fighter jets, Indonesia has agreed to invest 20 percent of expenses in return for receiving one prototype plane, gaining access to some technical data and information and producing 50 planes on its home soil. PT PAL, an Indonesian state shipyard, has teamed up with Daewoo Shipbuilding & Marine Engineering, a South Korean shipyard, to develop submarines. Under a 2011 deal, Daewoo Shipbuilding delivered two 1,400-ton submarines and the third one will be assembled in Indonesia.